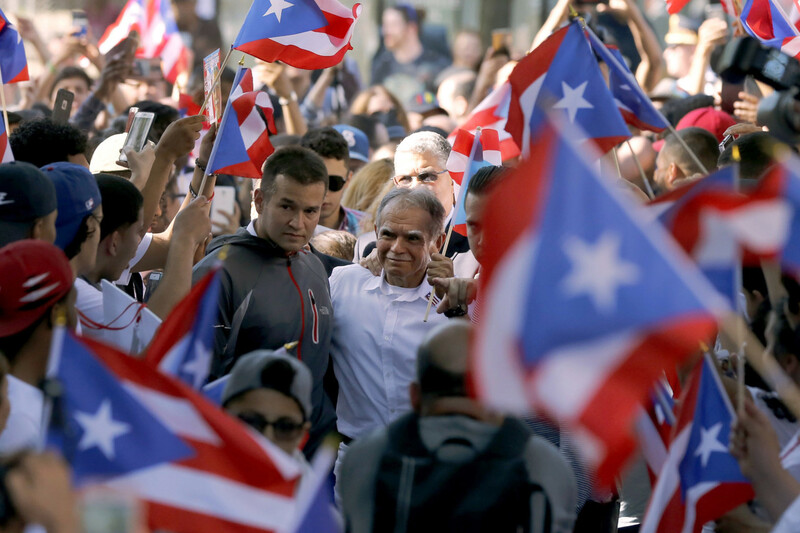 Sponsors and government officials marched away from the Puerto Rican Day Parade on Monday — with the New York Yankees, JetBlue and even the city’s top cop ditching the event over its decision to honor a deadly terror organization’s kingpin. Police Commissioner James O’Neill cited the bloodshed caused by the Puerto Rican nationalist group once run by Oscar López Rivera, who will be hailed at the June 11 march by the organizers of the annual celebration. “I can’t support a man who was the co-founder of an organization that engaged in over 120 bombings, six people killed and seriously injured police officers,” O’Neill said. Before President Obama commuted his sentence in January, López Rivera spent 36 years in prison for his role as a leader of the FALN, which was behind a series of bloody attacks, including the 1975 bombing of Fraunces Tavern in lower Manhattan that killed four people and a blast that maimed a cop at Police Headquarters in 1982. López Rivera’s defenders say he never directly participated in plotting a terror attack. The Yankees and JetBlue had been slated as sponsors of the parade, but both issued statements Monday announcing they would not take part, citing the López Rivera furor. They join another major sponsor, Goya Foods, which also recently bailed out. The Yankees’ boycott particularly stings. Bronx Bombers who have graced the parade include Puerto Rican native Bernie Williams. “The New York Yankees are not participating in this year’s Puerto Rican Day parade,” the team said in a statement. The Yankees had no further comment. Mayor de Blasio, who is expected to march in the parade, said he had “respect” for O’Neill’s views, but defended his own decision to participate. “We did not make this decision lightly and hope all sides will come together to engage in a dialogue about the parade’s role in unifying the community at a time when Puerto Rico needs it most,” JetBlue said in a statement. It was unclear if other sponsors will bail out. They include AT&T, Coca-Cola, CUNY, the Daily News and the United Federation of Teachers. A police union is urging the companies to back out or face a boycott by its members. “We are asking our members not to participate in the Puerto Rican Day parade. More importantly, as long as Oscar López Rivera is allowed to participate, we will be asking our members to boycott any corporation that continues to help fund this event,” said Lou Turco, president of the Lieutenants Benevolent Association. “We support the NYPD members who were seriously injured and the families of the innocent people who lost their lives during these attacks throughout the United States and in our city,” Turco said. Detectives’ Endowment Assocation President Michael Palladino slammed Council Speaker Melissa Mark-Viverito for her role in advancing López Rivera’s release and parade honor. “When elected, the speaker took an oath to uphold the Constitution of the United States. Mark-Viverito violates that oath every time she celebrates this terrorist,” Palladino said. She said the support for López Rivera was about “human rights,” not politics.